Once upon a time, you couldn't flip through a European newspaper without coming across the polemical manifesto of a budding avant garde artists' movement. The major movements of the 20th century—Dada, Fluxus, Futurism, Surrealism, Suprematism, and so on—all started with formal statements of intent written by artists, not critics, and often in inflammatory prose. In contrast, today's categories like "conceptual art," "relational aesthetics," "bio art," and "new media" refer to general trends in contemporary art as a whole rather than describing specific groups of artists who are professionally or socially associated with one another. What's more, these terms are more often cooked up by critics than by artists themselves. Yet artists continue to write, often in the form of PDFs that are so invitingly primed for distribution to your printer, iPad, or laptop screen, conveying dense expressions of their groundbreaking artistic ideas. But whereas the Modernist manifestos of old set out the artist's aesthetic agenda, and were, in that capacity, forward-looking, the contemporary manifesto is defensive, and more complementary than foundational. By and large, it serves to construct the proper conceptual framework with which to approach the artist's work. With the level of chatter surrounding contemporary art—from magazines and journals to blogs and social media—it's no wonder that artists feel the need to pipe in on their own behalf. And, in fact, it's an especially appropriate thing to do, since these artists' works are increasingly concerned with diffusion, decentralization, dematerialization, and a host of other centrifugal forces that threaten to fly off the radar of traditional ways of looking at art. These works need texts to tether them down. All of the following artists are known as much for their written texts as they are for their artworks. But how much weight does an artist's interpretation of their own work hold? QUOTE: "Suppose an artist were to release the work directly into a system that depends on reproduction and distribution for its sustenance, a model that encourages contamination, borrowing, stealing, and horizontal blur. The art system usually corrals errant works, but how could it recoup thousands of freely circulating paperbacks?" IN OTHER WORDS: If you want to free yourself from the strangulating forces of the market-driven establishment, try unleashing an artistic DDS against the system by flooding it with confusing work. 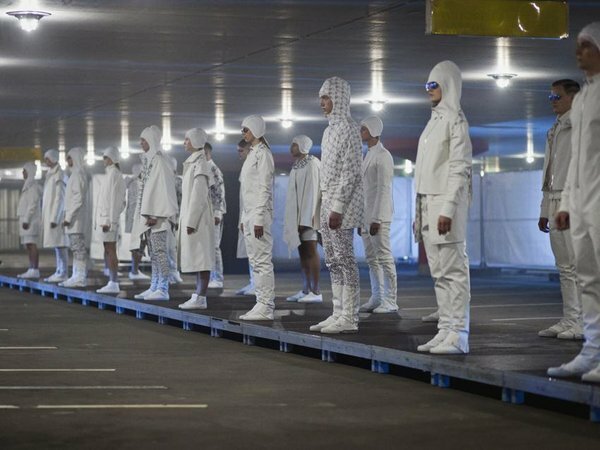 EXAMPLE: For dOCUMENTA 13 in 2012, Price and Tim Hamilton produced a fashion show with clothing that used the logos of Paychex, UBS, and other financial corporations as decorative patterns, appropriating the encoded symbols of the finance world and siphoning it into the aesthetic realm of fashion (a world populated with mass-produced 'collections'). Price and Hamilton's fashion line does exist, in fact, and was for sale at Kassel's Sinn Leffers department store during the show. QUOTE: "In the class society of images, cinema takes on the role of a flagship store. In flagship stores high-end products are marketed in an upscale environment. More affordable derivatives of the same images circulate as DVDs, on broadcast television or online, as poor images." IN OTHER WORDS: In the new digital world where images are critical forms of social currency, from one's Facebook profile pics to the photos you use to illustrate your professional output, new heirarchies of status are sneaking into the culture where people are judged by criteria like image quality and aesthetic, and we should know about it because it's really weird. 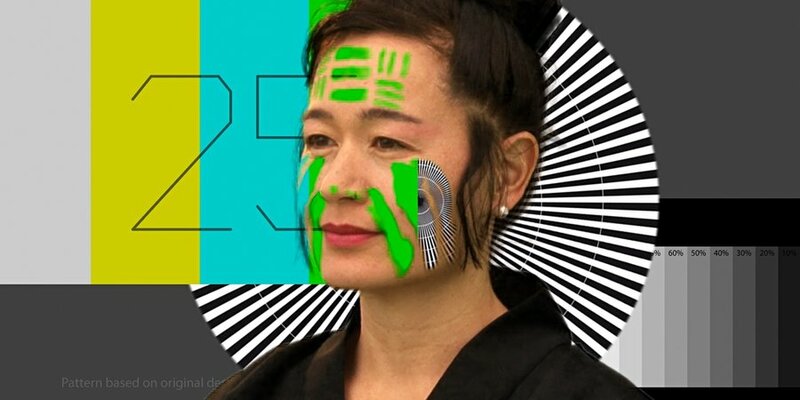 EXAMPLE: Steyerl's video How Not to Be Seen (2013) is an instructional video on how to disappear from contemporary society, whether by camouflage or through physical annihilation—the embattled cultivation of a "poor" self-image. 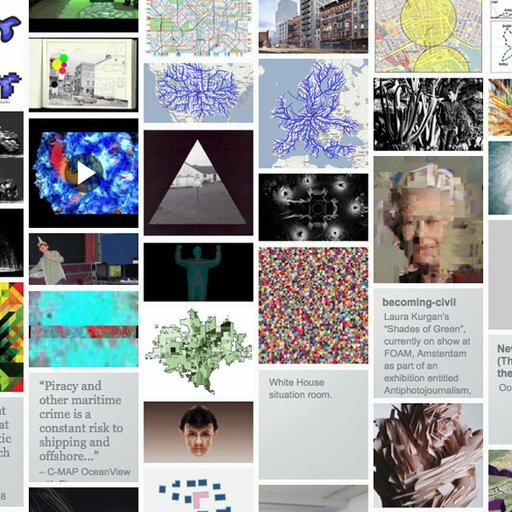 There is a harmonious counterpoint between Steyerl's writing, which is serious, and her artwork, which is satirical. Each stands on its own, but they also inform each other as complimentary entities. QUOTE: "Coaches, athletes, and sports enthusiasts alike tell us there's no 'me' in 'team.' Despite their expertise in the field, linguists themselves don't seem to enjoy the plethora of catchy slogans—or the hefty yelling of pep-rallies, for that matter. After all, there are certainly many me's in phoneme, lexeme, and morpheme. Notwithstanding the occupational hazards of those devoted to the tongue—misunderstandings, the untranslatability of language, Babel's broken record—language is 'not a place of closure and retreat; rather, it constitutes the always finite anthropological commitment to the world.'" EXAMPLE: Slavs and Tatars has published five books to date. 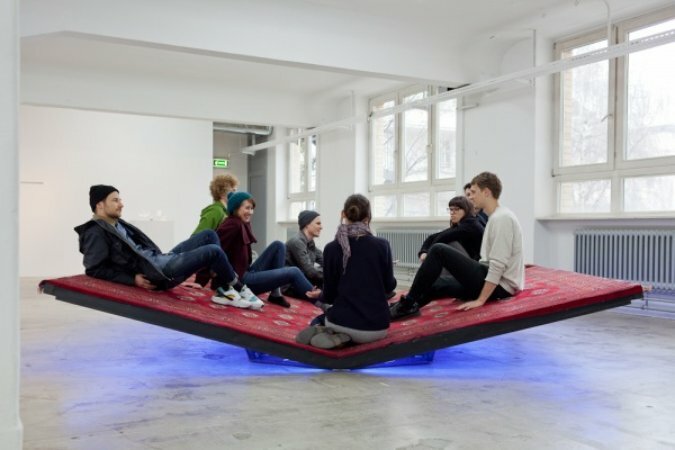 Their sculpture Prayway (2012)—"part installation, part sculpture, part seating area, and all polemical platform"—combines the shape of a rahlé book stand with the a public platform (literally) for discussion within the gallery space. It exemplifies the tricky collective's engagement with language, discourse, and representation. 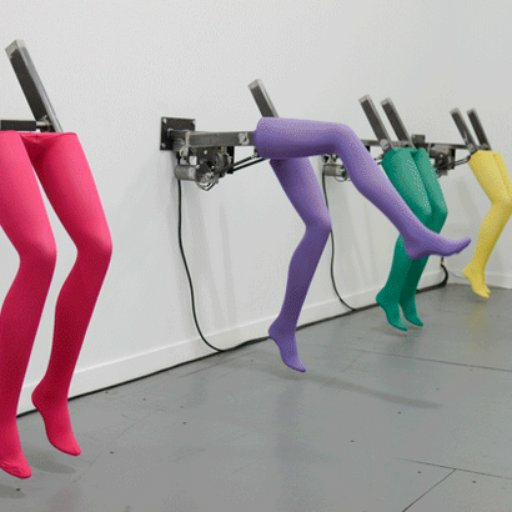 QUOTE: "The question is how to categorize art today in a way that will exceed the contemporary. The inclusiveness of the contemporary is under attack, as this very inclusiveness has helped suppress a critique of what art is and more importantly what comes next. We know what comes next as things stand—more contemporary art." IN OTHER WORDS: "Contemporary art" is a useless and counterproductive term, because it pretends that the way something avant-garde looks has to be dependent on the way something avant-garde looked five years ago—after all, if everything is "contemporary" then nothing is. Artists need to try to do things that are really, really different and new. 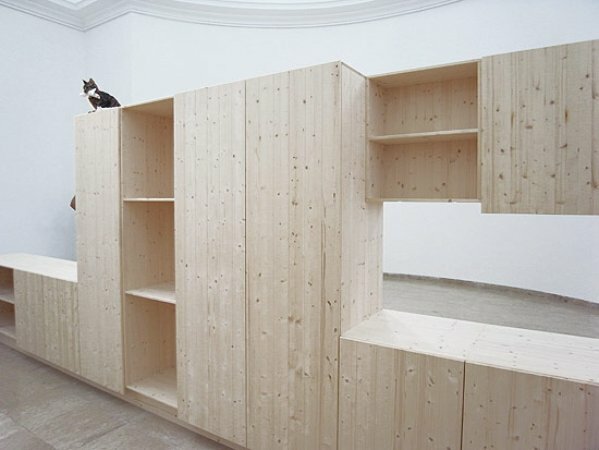 EXAMPLE: Liam Gillick's installation at the 2009 Venice Biennale's British Pavilion included raw wood furnishings and an animatronic cat that recited a repeating monologue to visitors. One interpretation is that Gillick was "letting the cat out of the bag," so to speak, but pretty much everyone was flummoxed. In this case, at least a cursory look at the piece's companion text, How are you going to behave? : A kitchen cat speaks, which was available at the show, was an irreducible necessity. QUOTE: "Even if an image or object is able to be traced back to a source, the substance (substance in the sense of both its materiality and its importance) of the source object can no longer be regarded as inherently greater than any of its copies." IN OTHER WORDS: The Benjaminian notion of the original artwork having a special aura that copies can't convey has been outmoded by the Internet, since we engage with copies of copies of images of things all the time, and in today's world there's often functionally no difference between engaging with the copy or the embodied original. 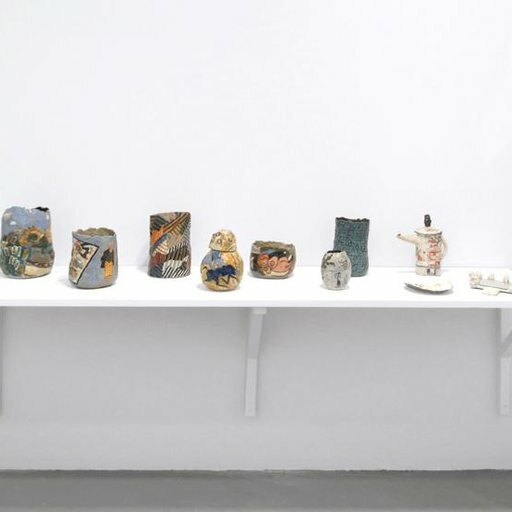 EXAMPLE: Artie Vierkant regularly produces and exhibits multiple copies of digital works that he calls "Image-Objects." 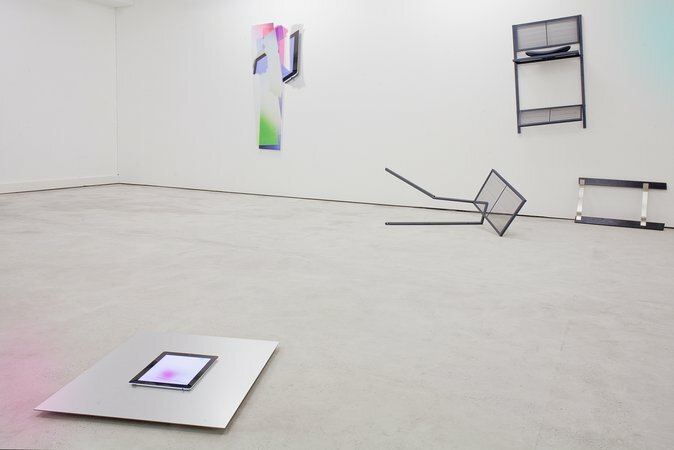 These are infinitely reproducible and, like the work in the image above that's displayed on an iPad screen on the floor, are often ephemeral in nature. 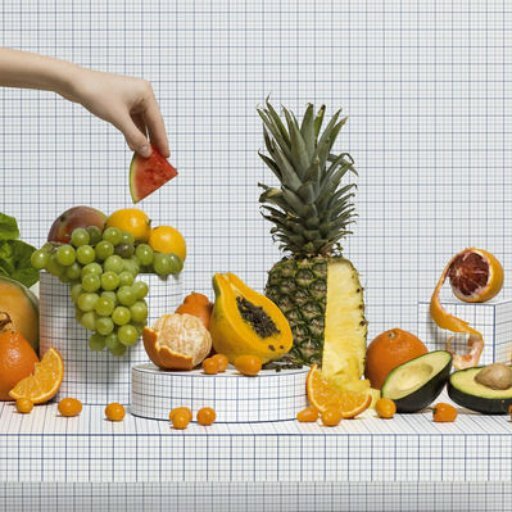 The frame of the "Image-Object" helps to mollify a potential technofetishistic reading of Vierkant's work, shifting the focus of the artist's production away from the digital processes used to make and show them and toward a greater conversation about the distribution of images as information. QUOTE: "Except to stalwart adherents of trickle-down theory, it must be abundantly clear by now that what has been good for the art world has been disastrous for the rest of the world. How can we continue to rationalize our participation in this economy? In the United States, it is difficult to imagine any arts organization or practice that can escape it. The private nonprofit model—which almost all U.S. museums as well as alternative art organizations exist within—is dependent on wealthy donors and has its ninteenth-century origins in the same anti-tax and anti-government ideology that led to the current situation: the principle that private initiatives are better suited to fulfill social needs than the public sector and that wealth is mostly productively administered by the wealthy." IN OTHER WORDS: We mostly liberal art-world people are hypocrites, since the inequalities dividing society are epitomized by the money-soaked world we live in—so we've got to figure out what's up with that, and at least face it head-on. EXAMPLE: For her video work Untitled (2003), Andrea Fraser arranged to videotape a sexual encounter with a wealthy art collector, who agreed to participate in the event only if it were to be understood as the commissioning of an artwork. This work exists as five DVD copies of the video, but the real subject is artists' fraught relationships with their benefactors. Without a preamble from the artist, this challenging work could easily be misconstrued as something much more base; in this case, context is, indeed, everything.